An amazing themed lumberjack party takes more than a couple of plaid shirts. 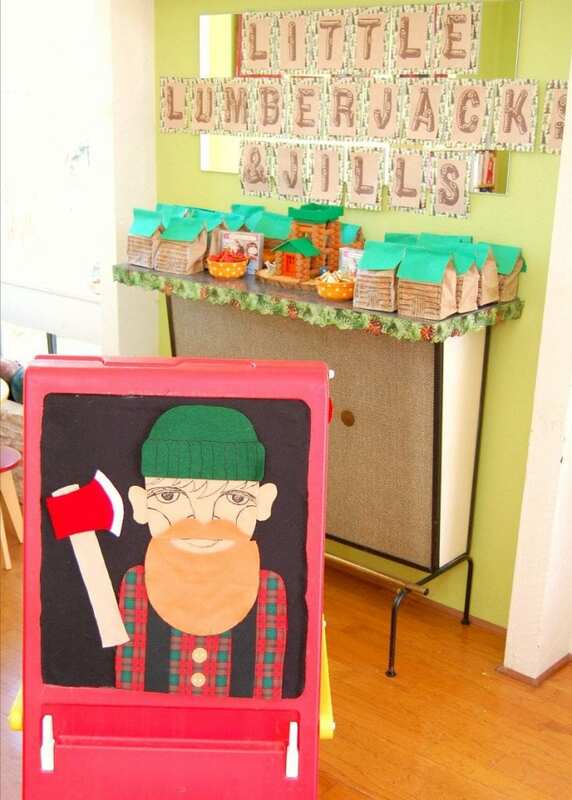 You need mini log cabin goodie bags, axes as centerpieces and pin the beard on the lumberjack games. I tend take a theme and run with it and lumberjack parties are no different. Actually, this party was a Little Lumberjacks and Jills birthday party for my kids. Girls just wanna saw logs too! 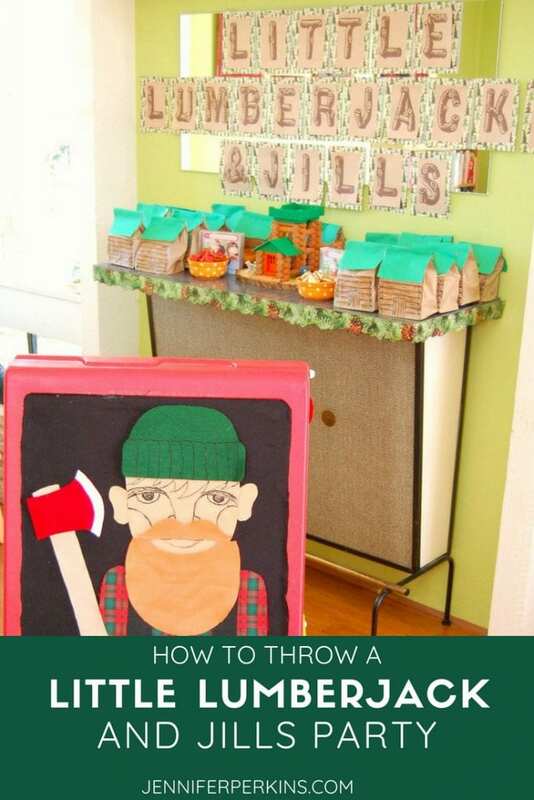 Not just kid’s birthdays this is also a fun idea for co-ed wedding showers, gender reveal parties – almost any event could work with a lumberjack theme. Keep reading for a few of my favorite custom DIY touches to make sure you next lumberjack party is perfect! You know what makes the perfect lumberjack party centerpiece? Lincoln Logs! 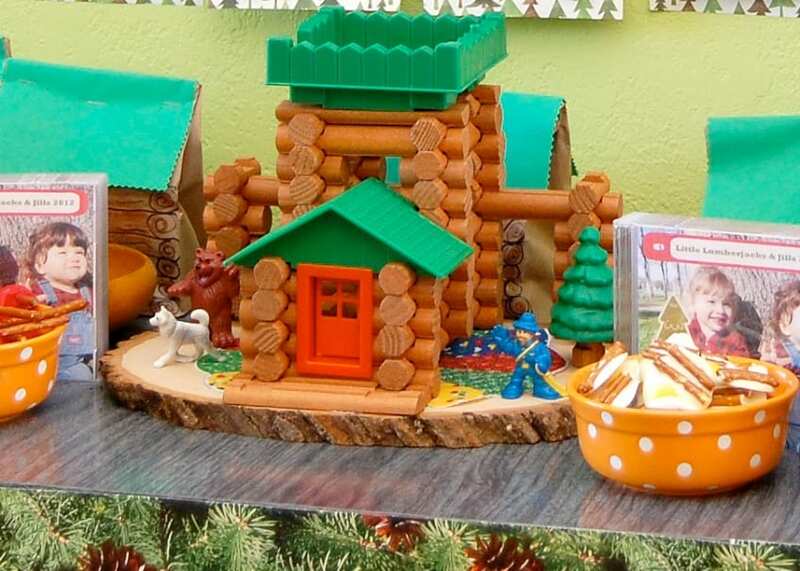 They even have a log cabin kit complete with bear, dog and of course a lumberjack. Looks great on the goodie bag table or next to the birthday cake. Speaking of cake, we actually did not have any at this lumberjack party. 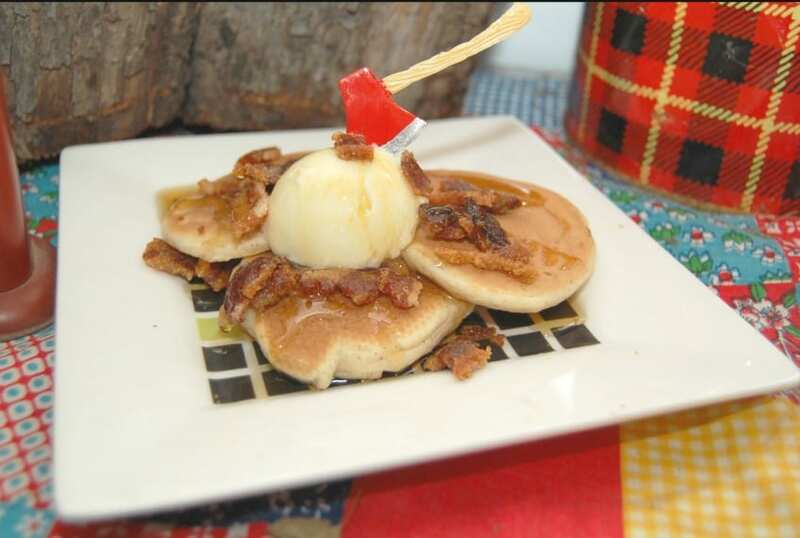 We went for a lumberjack breakfast theme serving silver dollar pancakes in place of cupcakes. 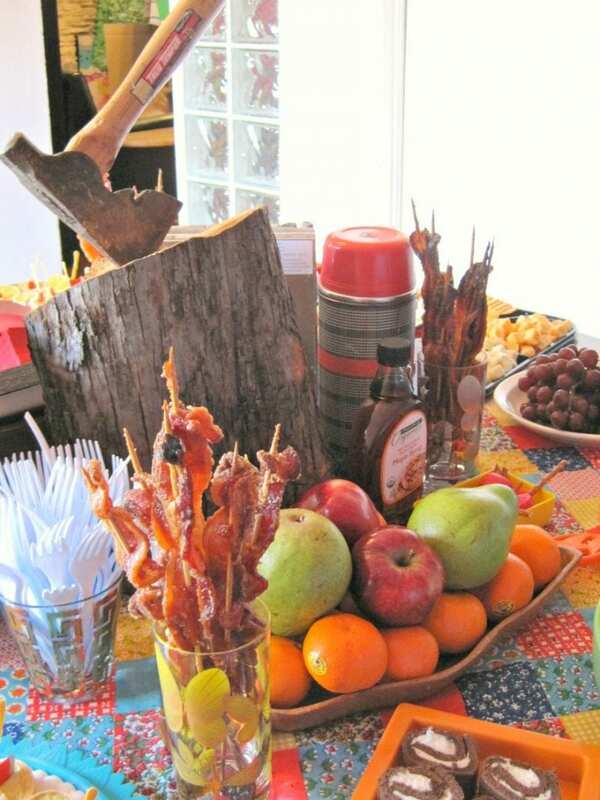 Other fun lumberjack party food ideas include: candied bacon on a stick, maple syrup ice cream and bacon and egg candies. Also, can we talk about how cute these wee little axe cupcake toppers are! 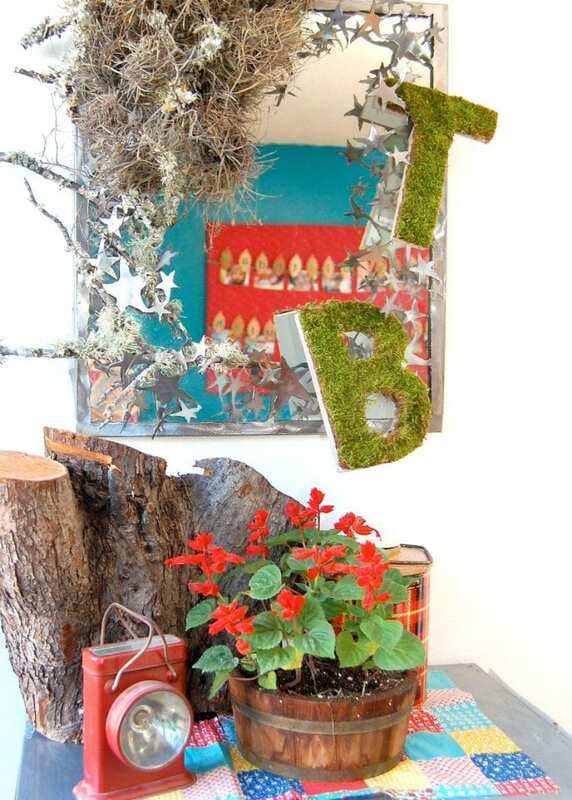 No corner was left un-decorated – to celebrate the birthday boy and girl I hung some DIY moss covered initials I had made. Old tree stumps, a thrifted plaid thermos and ball moss collected from the park finish off the look. 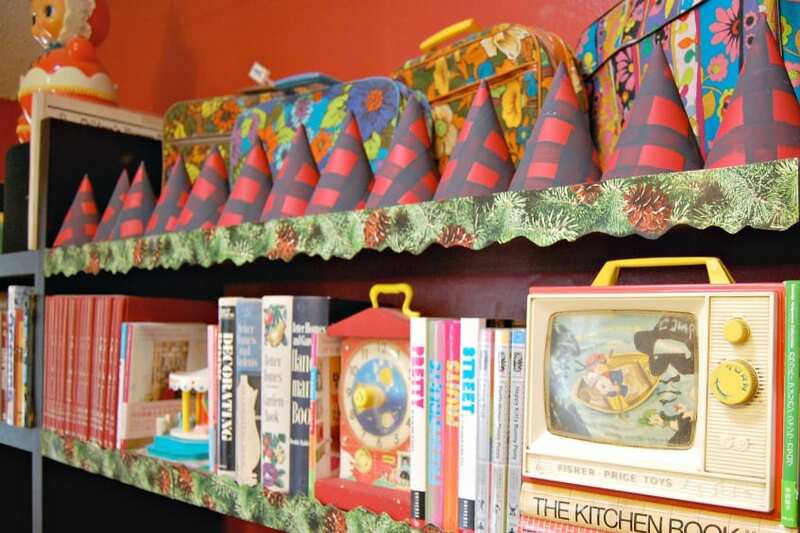 I know I feel like wearing a plaid lumberjack costume just looking at this vignette! Is there such a thing as too many banners at a party? I think not. 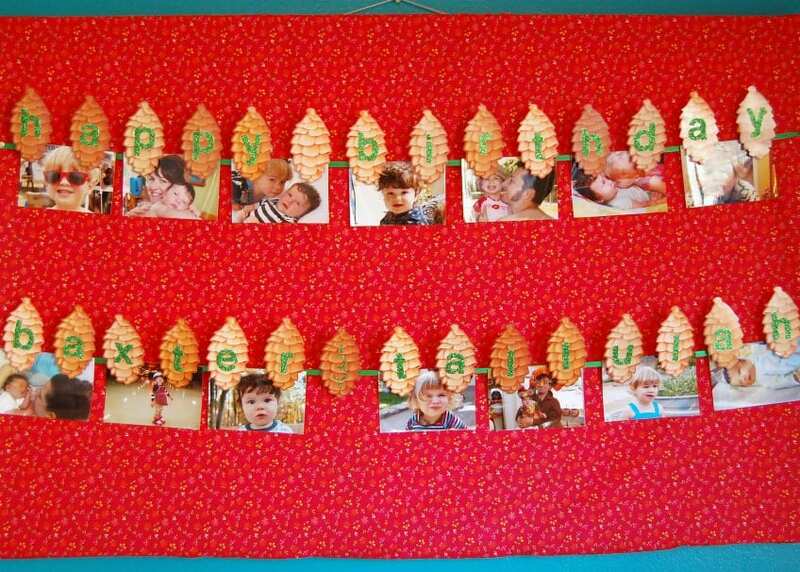 Figure I’d showcase a few pictures of the birthday kids with a customized birthday banner. I just added sticker letters to pinecones from the teacher store! Thinking of lumberjack party food ideas can be tricky. I kept up with the lumberjack breakfast theme and went with swiss rolls that look like cut logs, donut hole acorns and candy axes made from pretzels. The goodie bags (filled with rubber ducks dressed as lumberjacks – yes they exist, pancake mix & bubbles) were made to look like log cabins. We also had mixed CD’s for the adults with songs like “Feed the Tree” by Belly, “Start Chopin” by Dinosaur Jr. and “Lumberjack” by Johnny Cash. We thought better of buying a log cabin playhouse and instead made our own out of a cardboard box. 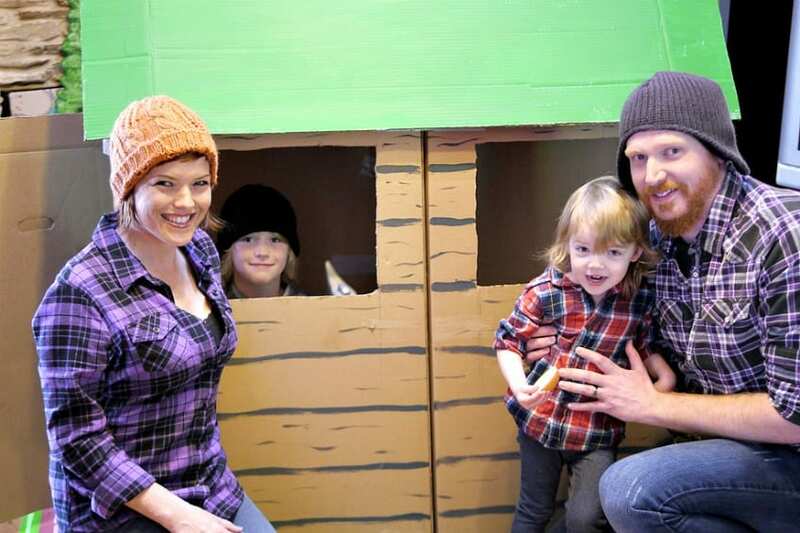 All the little kids enjoyed playing inside and it also doubled as the perfect lumberjack party photo booth! Pop over here to see how to make your own DIY log cabin. Every self respecting lumberjack needs beard and beanie options. 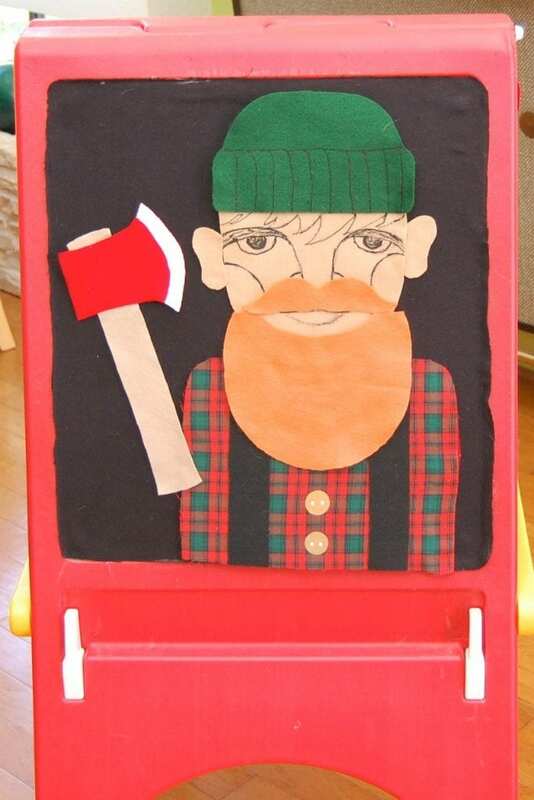 Make your own lumberjack party game with a DIY wool and felt board for the kids to play with out of old toy easel. For older kids this could be switched to a pin the beard on the lumberjack game. Toddlers love them a sensory bin. 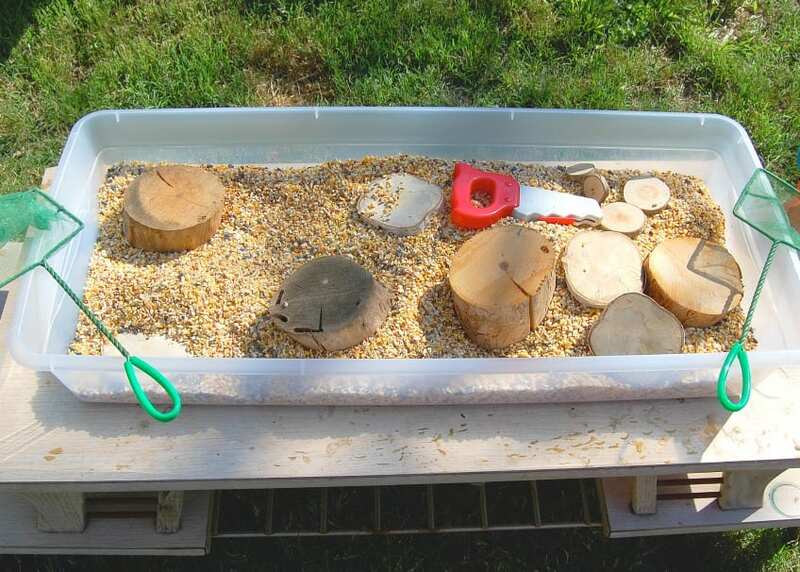 I filled a large tupperware with birdseed, pieces of wood, scoops, faux saw, nets, ball moss and let the kids have at it. I still have flocks of birds in my backyard gobbling up left over sensory bin bits. 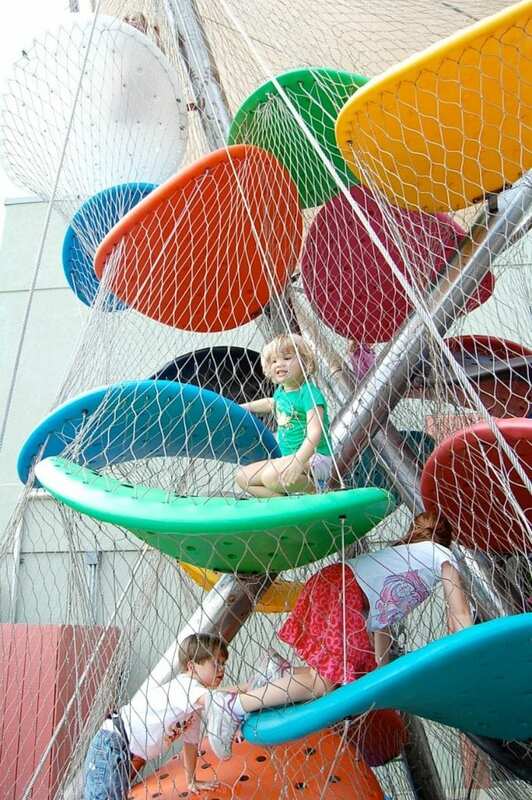 Take the party guests ages into consideration when filling your sensory bin. Look out for anything that littles might choke on. Needless to say buffalo plaid lumberjack themed party hats were hard to come by. I didn’t let that stop me, I just made my own. 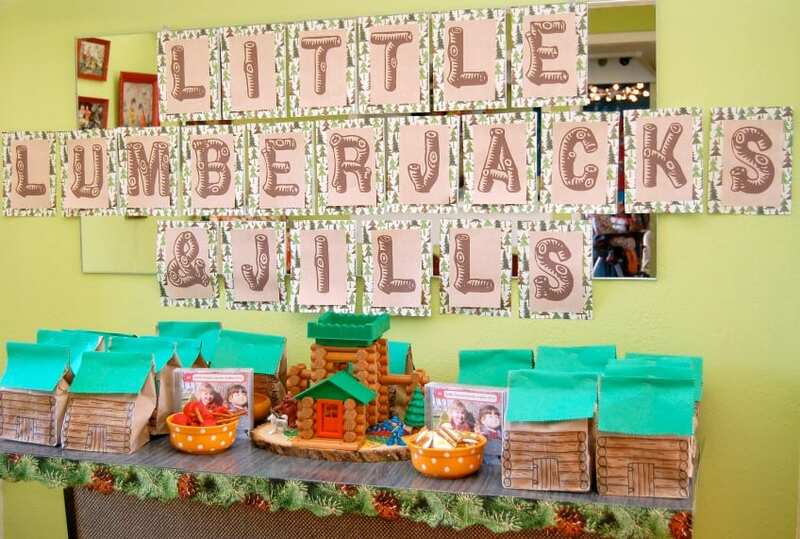 Pop over to my post about creating a customized lumberjack and Jills party for all the details on how to make your own. When kids are young you gotta work those obscure party themes before they are old enough to start forming opinions and you are forced to come up with ideas for a Frozen themed birthday party (no offense Elsa). 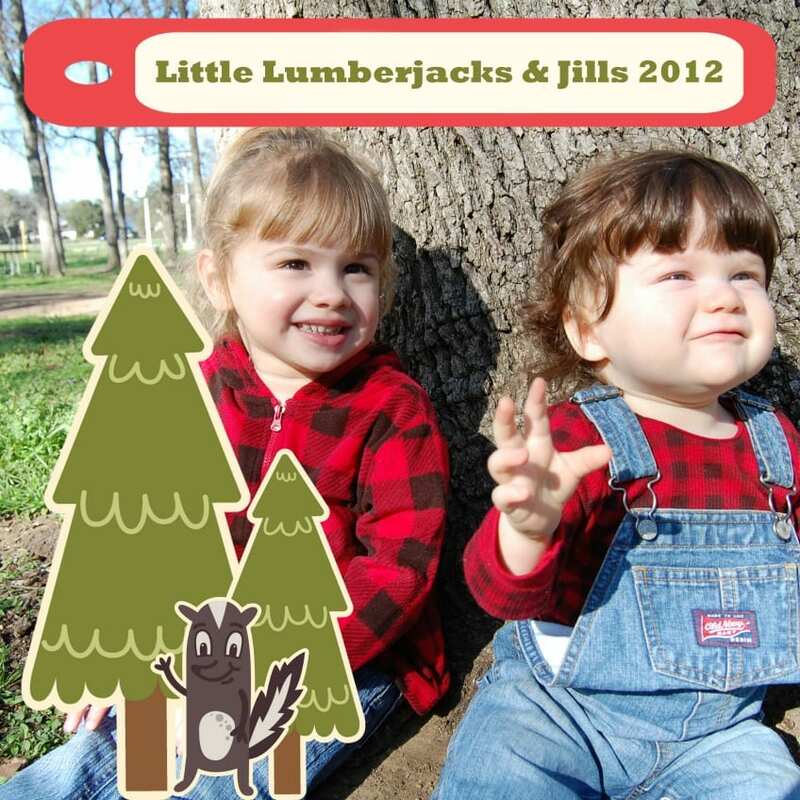 I even went so far as to set up a lumberjack themed photoshoot for the invitations. What is the most obscure party theme you have ever thrown? How about most obscure that you have attended? Who knows I might get lucky and get to pick the theme next year too. Looking for more party ideas? Keep reading! 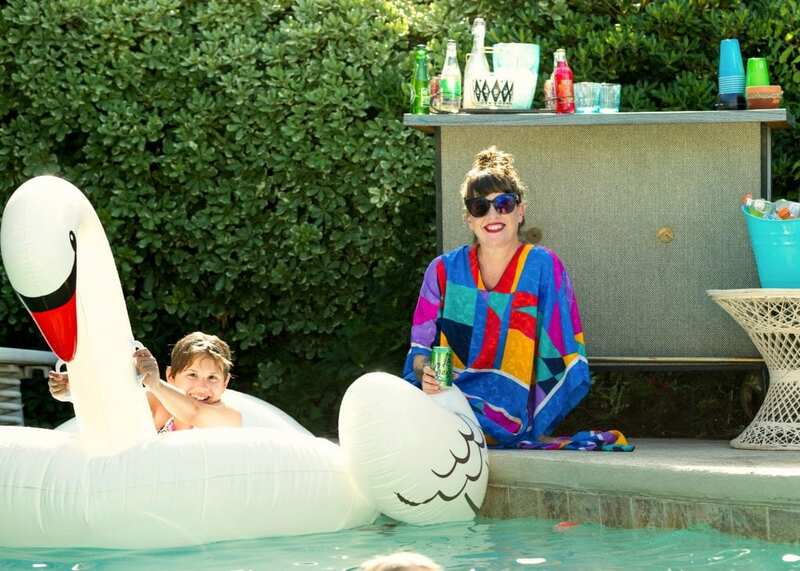 How to Throw a Summer Pool Party That Kids (and Moms) Will Love – as they say a failure to plan is a plan to fail – remember that with every party you throw. Why My Family Chooses Experiences Over Parties – I know I just got through telling you about a lumberjack party, but as my kids got older we started skipping the birthday parties and taking trips and having experiences instead. 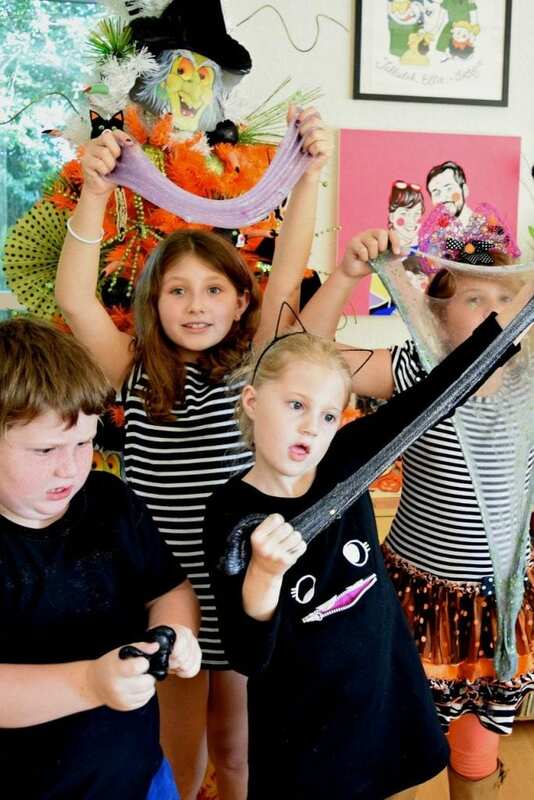 Halloween Glitter Slime Party – Gather up some friends and let the glue flow. Nothing says party like a slime making party. Posted March 20, 2012 & filed under Holidays, Parties. This is just fantastic! What a cool mom you are! You are amazing, Ms. Perkins! You also look amazing! I have officially used up today's quota of exclamation points. How flipping adorable is this! And I have to say… Your looking thinner, keep up the good work. The bacon idea looks cool, but I couldn't find the food explanation. Can you tell me what you did?